Attention Divas! I know we’re all out there showing the world what we’re made of (that’s what makes us the fabulous divas that we are) but beneath those steel-toed stilettos, we all have the secret Cinderella fantasy of the storybook Arthurian romance. So take a page out of Guinevere’s book, travel to one of the most enchanting destinations in the world, and let yourself sink into the magic–conquer the world later! 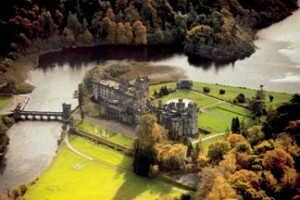 Ashford Castle, Ireland’s most historic five-star castle hotel and arguably the Emerald Isle’s most romantic destination, is rolling out the red carpet for couples with a special Proposal Package, available now through April 30, 2011. Valid through April 30, 2011, the package is based on double occupancy and is priced at €450 (approximately US$615) per person. This striking castle, which dates back to 1228, is set on 350 acres of County Mayo, on the shores of Lough Corrib and the River Cong, with a spectacular backdrop of woodlands, lake, river and mountains. What more could a girl ask for as the setting of her engagement! Ashford Castle and Estate boasts not only picturesque beauty, but has also been ranked Best Resort in Ireland in Condé Nast Traveler’s 2011 Gold List, won the 2010 Gold Medal from the Green Hospitality Award and has been listed in Trip Advisor’s 2010 top ten picks for European castle hotels. So go ahead, send this link to your honey and give him a nudge in the right direction!